If you need to manage email signatures in Office 365, please check out CodeTwo Email Signatures for Office 365. 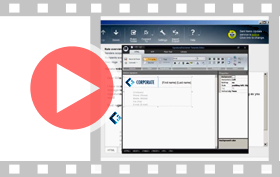 Configure rules in the Administration Panel and let the program stamp all emails traveling through Exchange 2013 server with an email signature or disclaimer of your choice. Once all the settings have been configured, the process of adding signatures is fully automated. Individual users or groups of users, e.g. marketing department can get different signatures - it is up to you who will get which signature. The same template does not need to be used for every employee – you only have to configure it within CodeTwo Exchange Rules 2013 and the program will do the rest. You can create unified email signatures for every employee in the company from one place using the program’s Administration Panel. All signatures will be added to users’ emails directly on the Exchange server so you have full control over it – no end users involved. Make use of Active Directory placeholders to compose fully personalized email signatures for everyone in the company. The user’s data will be added to the signature on the fly while traveling through Exchange 2013 server. Add to a signature your company logo, employee’s photo or boost your marketing campaigns by using banners or advanced graphics. All this can be composed within a handy HTML template editor available in the program. As QR codes seem to be more and more popular, we added this feature to the editor to let you make your signatures fancier. You decide whether QR code should contain links, vcards, text or any other information. You can send emails from any mobile device or email client and still be sure that they will be stamped with your signature as long as the email flow goes through your server with CodeTwo Exchange Rules 2013 installed on it. Design your email signatures in three formats: HTML, Plain Text and RTF within built-in WYSIWIG template editor. Use available tools to, e.g. add social media icons, photos, images or to adjust font of your signatures and disclaimers. Once you have configured Sent Items Update service, you will be able to check your signatures in the Sent Items folder. Natively this feature is not available as signatures are added directly on the server. Take advantage of CodeTwo Exchange Rules 2013 and use it to boost your marketing campaigns. Add clickable banners, promote your products, or inform about discounts. The program will help you achieve your email marketing goals. The program can add email signatures anywhere in the email – Exchange itself does not offer this functionality. Configure the program settings so that the signature is placed, e.g. directly under your last response or as a header. You can check whether your brand new rules work properly before they are implemented in a real environment. Once everything has been verified and it works as expected, you can start sending real emails with your new signature. To run the program on your Exchange 2013 server, you need just a few moments. Simply download the installation file, and run it to go through a setup wizard. Make use of the Template Library which contains ready-to-use email signatures to start testing the program right after the installation is finished. Test the program for 30 days for free. During a trial period, the program works as a full version so you can test all its all functionalities. If you need more time for testing, you can contact our technicians so that they will extend the trial period. The program can be returned within 30 days from the purchase date without telling us the reason – no questions asked. Centrally deploy personalized email signatures, legal disclaimers and branding to emails sent from Exchange Server 2013.